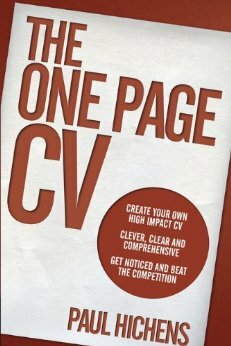 The One Page CV is a refreshingly new kind of resume book, written by one of the top resume writers in the world it can help you write a concise, powerful, high impact resume via easy-to-follow examples and clear and helpful practical hands-on sessions. The resume you create won’t be a typical one – but that’s a good thing, as you need to stand out, and nothing stands out more than a top quality one page resume. The lessons you will learn are not based on the usual outdated resume writing myths, but based on real sales and marketing principles that are tried and tested to get outstanding results in the job market. If you want to beat the competition, and get a head start up the career ladder then The One Page CV can help you like no other resume book.